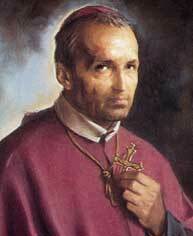 St Alphonsus was born the eldest of seven children into a noble family at Marianella, Italy. He received a good education and at the age of 16yrs transferred to Law School. St Alphonsus became a very successful lawyer but foundthe life spiritually unfulfilling. After much conscience searching, at 27 he relinquished the role and became a novice at the Oratory of St Philip Neri. Three years later he was ordained a priest. His initial pastoral work was among the extremely poor, homeless and marginalised of Naples. He established Evening Chapels – managed by the local youth – where people participated in prayer, education, community and social activities. The Chapels were a resounding success and quickly multiplied. He also founded The Redemptorists (Congregation of the Most Holy Redeemer) whose function was to teach and preach among the slums and poor. St Alphonsus was a prolific writer, publishing in total 111 works on spirituality and theology. He also scripted the often used Meditation on the Stations of the Cross. In 1762 he was appointed Bishop of St Agata Dei Goti. The feast of St Alphonsus is the 1st August. He is Patron Saint of Confessors.